When friends Nick White and Mike So decided to go on a road trip across America they never envisioned it to be anything but a boys’ trip across the land of the free. 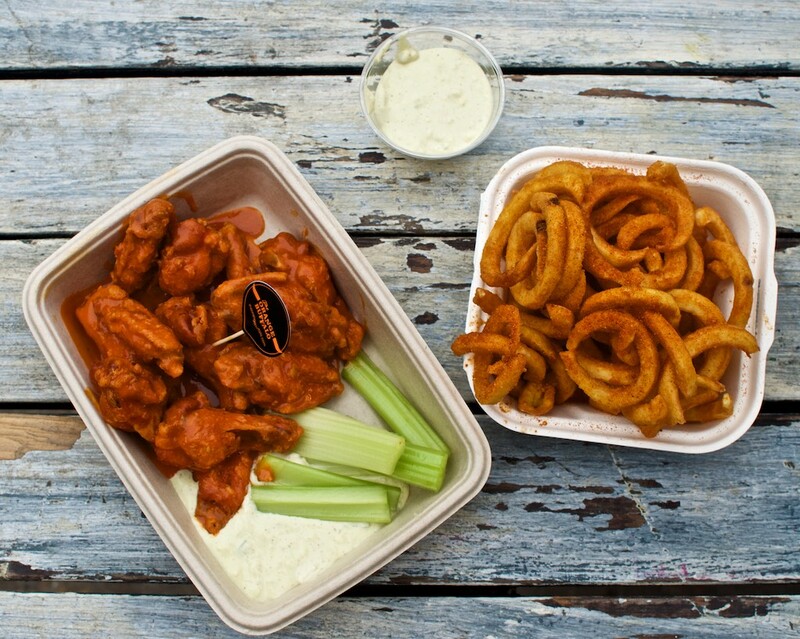 Five years later, the two are proud owners of The Orange Buffalo at Ely’s Yard, Old Truman Brewery, with a band of loyal followers who regularly line up for some deliciously spicy wings. Their journey began when Nick, a photographer from Hull, visited Mike, an illustrator living in New York. The pair hit various fast food joints down America’s South-East coast where their love for buffalo wings was born. The seed planted, the pair did some research. Sensing there was a gap in the market when it came to spicy wings in London, Nick and Mike began thinking about going into business together. When Mike flew across the Atlantic to visit Nick, they decided over a couple of pints to start their very own street food stall. “He only had one week’s worth of clothes”, tells Nick of Mike’s initially short trip. Mike, however, didn’t return to the US. Instead, the boys found themselves an old trailer on eBay, picked it up in Swansea, and got to work creating their business. You would be forgiven to think that they actually sell buffalo wings. “We get that all the time, the wings would be a lot larger if that was true and I’ve never seen a buffalo fly, especially in East London”, Nick jokes. The term ‘Buffalo Wings’ comes from upstate New York where chicken wings are typically deep-fried, unbreaded and covered in butter and cayenne pepper hot sauce, also known as Frank’s Hot Sauce. The sauce is their secret weapon. The ‘Original’ is the boy’s take on Frank’s Hot Sauce. As the business grew, so did their sauces, the popular ‘Woof Woof’ was named by a customer and the recipe is revisited frequently based on their feedback. The ‘K-Town’ will be their sixth addition to their menu, a sauce influenced by the Korean gochujang chilli paste. The pair has always maintained the importance of being personable and connecting with their customers, it’s a common sight to see a regular pulling up a chair to the hatch, chatting to Nick and Mike, Woof Woof sauce dripping from their hands as they enjoy their fourth buffalo wing. Similar to many street vendors, The Orange Buffalo dreams of establishing a bricks and mortar chain. “We want a store in every town and city in the whole damn world!”, Nick yells out, playfully acting as if he is running for office. Two years ago the pair opened up a kitchen in The Joker Brighton, extending their menu to offer sandwiches, sides, beers and one hell of a veggie burger. Nick and Mike tested the water before making that leap. “We know after five years we have a loyal following, people love it. Still to this day after they have finished a portion they come back to the hatch and say ‘that was really enjoyable thanks for that guys!’ There’s not a lot of places they would do that, you know what I mean? They usually grab it, eat it and go. But they make a point of saying, ‘they were the best wings I’ve had in a long time’, or if they are American or Canadian, ‘it’s just like home, you guys got it nailed down!’. Too often Nick meets affluent kids bored of their banking jobs who decide to take the plunge into street food, serving ‘lobster sandwiches from VW campers at a festival’, only to realize working in street food is a hard gig. Nick recalls their opening in 2012, “we had the Olympics, the Euros and Queen’s Jubilee, so many things happening but it pissed all summer, that was our first year and we were thinking OMG is this what it’s like? touch wood, it got better and we soldiered on”. As tough as the job is, Nick’s love for the industry prevails. He continues to engage with his customers and is still totally involved in the whole operation. “It’s nice to do the full thing, prepping, cooking, serving and keeping that romance of the open kitchen where customers see the drama of you clinking and clanking, sauce flying everywhere, they wanna see it”. Nick is, by nature, sociable and charismatic; qualities that are fundamental to the success of his company. With The Orange Buffalo and its wings taking flight across the capital, be sure to head to Shoreditch for an authentic taste of Americana from this road-tripping duo. 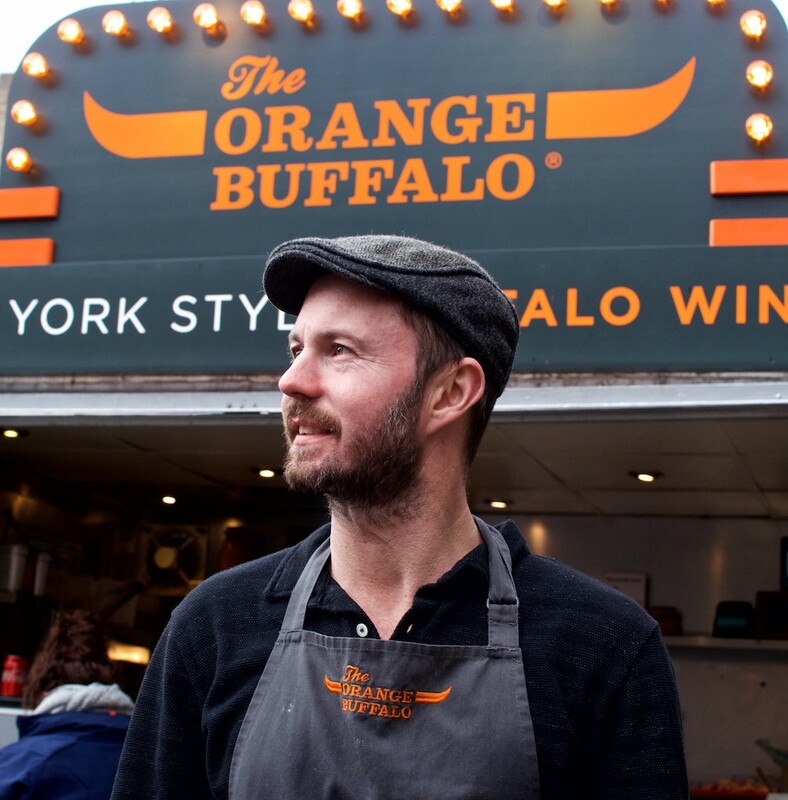 Find Nick on any given day chatting away and serving great food at The Orange Buffalo in the Old Truman Brewery or check out their kitchen at The Joker Brighton.